Bubble Bash Mania v1.0 – Travel from the hot islands of Saint-Tropez to the icy breezes of Ice Station and solve bubble puzzles along the way! Match bubbles of the same color and shoot them down! Set sail and become a bubble-bashing master in this new free and fun bubble-shooter puzzle adventure game! 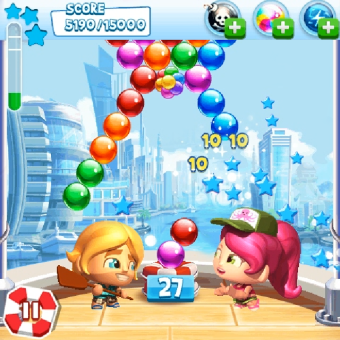 o Discover 200 free bubble-bashing puzzle levels in 10 fun, adventure-packed locations! o Shoot the bubbles, reach the target score and free the goldfish to win! o Connect to Facebook for social fun and compete against friends and help them out! o Experiment with special bubble boosts to help you beat those challenging puzzles! o Play with easy-to-use controls: Just touch to aim and release to shoot! 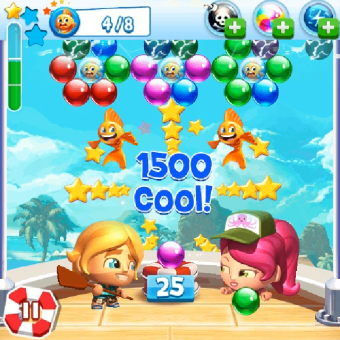 If you like free, fast action puzzle games, bubble-shooter games, match-three puzzle games and casual, social and fun adventures, then you’ll love Bubble Bash Mania!